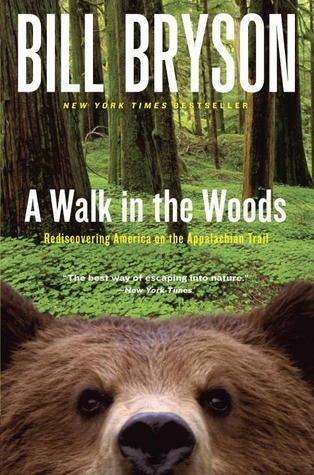 I love humorous and/or travel memoirs (see Tina Fey and Julia Child), and I have been interested in reading Bill Bryson for a while, so I decided to start with his experience traversing the Appalachian Trail, A Walk in the Woods. Of Bryson’s many novels, this one appealed to me first because of fond memories of a trip I took out East as a kid. I have some mixed feelings about the book. First, the not-so-great: Bryson’s attitude turned me off a bit. I can see how he may have been trying for self-depreciation, but it wasn’t so successful for me. He came across as condescending with an air of superiority, starting off on a bad note by openly and early on saying, to paraphrase, that Americans are fat, lazy, and stupid. He mocked or was rude to nearly every person he met on the AT (women especially… naming one Betty Slutz!? come on!). I felt he was cruel in his depiction of Southerners. He talks about mankind’s damaging effects on the AT (and absolutely rightly so), but presents no suggestions for preservation. I would have liked more mention of the good that the army of AT volunteers do to upkeep the trail year after year, more inspiring stories of people who love the trail rather than his contempt for people better prepared than he for the trek. I wonder, though, how much he exaggerated the characterizations of these people for the benefit of his readers… and it’s a fact you can’t please everyone. So, perhaps his humor and attitude was lost in translation on me in writing; I would give him the benefit of the doubt that A Walk in the Woods could be better experienced in audio form. The good, though, and there is plenty: Bryson’s affection for nature and appreciation for its grandness is wonderfully apparent. I loved his acute articulation of the Appalachia Region’s breathtaking beauty, and how it is right here in the United States. His descriptions are elegant and helped easily visualize of the sweeping views and wild animals along the way. The research and anecdotes about the history of the AT, its dangers to us, and threats to its existence (natural and man-made) were incredibly engrossing. Much of the book was fast-paced and hard to put down. Katz, his travel companion, was a crass oaf, but pleasantly ridiculous and totally endearing by the end of the book. I do appreciate Bryson’s honesty about the difficulty and challenges of the AT, and his admission he was totally unprepared (which I did find humorous; this part was successful!). The best part of reading AWitW for me was that it brought up memories of that great 1993 family trip. We toured Washington D.C. (I remember being angry that we didn’t have time to go to some museum I wanted to see…), spent time in Virginia Beach (I remember being really sick there…), and went further into Virginia to see Thomas Jefferson’s Monticello (LOVED) and Shenandoah National Park, where we drove Skyline Drive through the Appalachian Mountains. The part about Harper’s Ferry really resonated with me—he was there just a couple of years after us! He described the town exactly how I remember it. After reading the book I was pleased to find National Geographic’s documentary on the Appalachian Trail streaming on Netflix, which I fully recommend to check out for more about what people are doing to preserve the trail and its surrounding environment. Overall, I did like it, but didn’t love it. Bryson’s way with words and passion about specific subjects and history (as apposed to other people, I guess) held my attention and saved the book for me. I’m still interested in reading his A Short History of Nearly Everything. Read from June 14 to 22, 2012. This entry was posted in books and tagged environment, history, humor, memoir, non-fiction, travel by kristin @ my little heart melodies. Bookmark the permalink.